Today Huzur delivered his Friday Sermon on the Divine attribute of Al Wasi (the Bountiful, the All-Embracing). Huzur explained that ‘Wasi’ is that Being Whose provision and Whose mercy encompasses all creation. Whose self-sufficiency overrides everything, a Being that bestows limitlessly, Who encompasses everything. Huzur said all these references can be found in the Holy Qur’an. In verse 269 of Surah Al Baqarah Allah states: ‘Satan threatens you with poverty and enjoins upon you what is foul, whereas Allah promises you forgiveness from Himself and bounty. And Allah is Bountiful, All-Knowing.’ (2:269) Huzur explained that the verse cites two factors that Satan employs to drive God’s servants away from Him; fear of poverty and foulness. Fear of poverty is of many kinds; as Satan had said to God that he would sit and waylay God’s people on every path, indeed, he left no stone unturned. His waylaying was not with his own power but due to the fact that God permitted him. God made it clear to His people that Satan would entice in ways that would appear good but the consequences of these would be terrible. Allah states in the Qur’an: ‘…And Satan desires to lead them far astray’ [Surah Al Nisa (4:61)] as well as ‘…Satan is to you an open foe…’ [Surah Al A’raf - (6:23)]. Referring to the above verse Huzur said its reference is not limited to Adam and Eve but is a warning to all men and women that Satan is your audacious enemy therefore be heedful of his temptations. The Promised Messiah (on whom be peace) said that the events stated in the Holy Qur’an are not mere accounts of old, rather these are also prophecies for the times to come, therefore believers should be mindful. Huzur said Satan alters his ways with changing times. Each new invention that is beneficial also carries the caution that Satan also uses it. In the Surah Al Baqarah verse God states that Satan intimidates you with fear of poverty. The Arabic word in the verse ‘faqara’ denotes poverty as well as the breaking of the vertebrae. This signifies that Satan threatens that sacrifices in the name of God would, as if, render one unable to support oneself and would leave one behind in the world. Satan intimidates against sacrifices in many ways; strays one from worship of God and instead carry out worldly businesses, puts fear of monetary loss and poverty in hearts so one does not make time for causes of God and spends all one’s time in making money. Huzur said however, God’s servants are not intimidated by Satan. Huzur said he read an article in Al Fazl (Urdu newspaper) which cited that a person stood buying meat at butchers in Rabwah when the local finance secretary of the area passed by on a bicycle. The secretary stopped to remind that person that he had some balance to pay on his chanda (financial contribution). The person asked how much the balance was. When told, he paid it there and then and took a receipt. However, he returned the meat he had bought at the butchers and said his family would have a simple meal that day. Huzur said such are the people who are not tempted by Satan and it is not just one person, there are hundreds of such people in our Community who do not simply miss out on meat rather they even go hungry but make sacrifices. Huzur said there are also numerous instances of sacrifice of life in our Community; in particular the Ahmadis of Pakistan are faced with death at any moment simply for being Ahmadis and for living where they live. The supreme sacrifices of life of Sahibzada Abdul Latif shaheed and Maulwi Abdul Rahman shaheed illustrated that they did not withhold sacrificing their lives for a noble cause and for the pleasure of God. Huzur said there are dozens of other incidents where Ahmadis gladly offered their lives, staying firm on their belief and resoluteness and not merely as a consequence of a sudden attack. Huzur said in this day and age the economy is also referred to as ‘backbone’ thus Satan threatens those who give about the financial future of their children but God’s servant continue to give. The instance of sacrifice of time is one with which every Ahmadi who is associated with the Community is familiar for they give some time or the other to the Community even if it is attending meetings and gatherings. There is also a great majority who sacrifice their time and come to the Friday Prayers and pay no attention to Satanic temptations – then there are those who do not come to the Friday Prayers or even Eid Prayers. There is a significant number of Ahmadis who do not pay attention to Salat and instead remain busy in their business dealings. Other than threatening with poverty Satan also tempts man to spend money at matters that are foul, at worldly amusements and indecencies such as gambling and consumption of alcohol. He does this in a manner that man does not realise he is doing something wrong. Allah states in the Qur’an: ‘…And follow not the footsteps of Satan…’ [Surah Al An’am – (6:143)]. Huzur said it is utter ignorance to even imagine that there is any good in following Satan. If a worldly person was asked about his concept of Satan he would say ‘may God protect from him’, however, in following Satan such a person would be completely unaware of what he is doing. In leading such people astray Satan fulfils his original claim that he will lead majority of people away from God. Huzur said the way to come to God is to repent and turn to Him. Indeed, He forgives and enables one to do good in future. Huzur said through the reference of the word ‘ya’eedokum’ in the Surah Al Baqarah verse God has assured forgiveness. On the Day of Judgement Satan is going to deny everything but God promises that He will facilitate forgiveness. That He will bestow in this world and will also forgive in the Hereafter. While indulging in foul matters leads to troubles, physical ailments and many other losses, the believers are promised greater blessings. God states that He would open doors of His grace and believers will develop in spirituality. It is the promise of God, Who is Bountiful and All-Embracing and Who has ceaseless treasures of blessings. Every Ahmadi who makes financial sacrifice knows that God blesses each giving in an astonishing manner. The families of those who sacrifice their lives are witness to the fact that their sacrifices are a source of immense blessing for the families. These are the experiences that the Bountiful, All-Embracing God grants those who give and who sacrifice. God’s further favour and grace on His servants is thus that not only does He grant forgiveness upon sincere repentance, good works and sacrifices rather He employs angels to seek forgiveness for His servants. It is stated in the Qur’an: ‘Those who bear the Throne, and those who are around it, glorify their Lord with His praise, and believe in Him and ask forgiveness for those who believe, saying: ‘Our Lord, Thou dost comprehend all things in Thy mercy and knowledge. So forgive those who repent and follow Thy way; and protect them from the punishment of Hell.’ [Surah Al Mu’min – (40:8)] Huzur said here ‘bearing of the Throne’ signifies angels as explained in Surah Al Haqqah (69:18) or it means those attributes of God on which these angels have been ordained, Divine attributes which are described in Surah Al Fatihah, i.e. Rabb (Lord) Rahman (Most Gracious) Raheem (Ever Merciful) and Malik e Yaumideen (Master of the Day of Judgement). These are the attributes which come into man’s use in this world and are the fundamental Divine attributes. Those who believe and then repent, turn to God, do good works, it is for these that God’s angels, in particular those angels who are commissioned to facilitate these qualities on mankind and each angel who is assigned the respective attribute, prays to God with reference to that attribute on behalf of the believers. Similarly, angels subordinate to these [commissioned] angels also seek forgiveness from God for people. Huzur said man is full of mistakes and failings and when he stumbles inadvertently, these angels plead God with reference to His mercy and His boundless knowledge to forgive His servant. They refer to God’s mercy first to seek forgiveness because pardon only comes about with His mercy and this is why they seek His extensive mercy for this. They acknowledge God’s all-embracing knowledge and supplicate that if it is in God’s knowledge that these people would stumble in future may God’s overriding mercy make them do good works instead, and makes these good works eternal for them – the angels acknowledge that the people will only be so enabled if God’s mercy is forthcoming. This is the Most Gracious, the Great Forgiver, Most Merciful God Who employs all resources to forgive people and to keep them firm on piety. God states that He rewards sacrifice seven hundred-fold, in fact it can even exceed this because God is the Bountiful and all-Embracing and His rewards know no bounds. Yet man is ungrateful and leaves the Ever Merciful God and is tempted by Satan towards transitory pleasures. Huzur cited verse 157 of Surah Al A’raf (7:157) which reads: ‘And ordain for us good in this world, as well as in the next; we have turned to You seeking forgiveness. 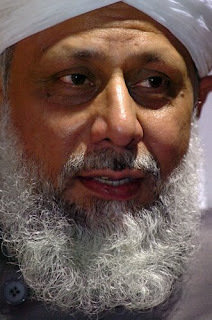 God replied, ‘I will inflict My punishment on whom I will; but My mercy encompasses all things; so I will ordain it for those who act righteously, and pay the Zakat and those who believe in Our Signs – ‘ and explained that as the Promised Messiah (on whom be peace) said the events of the Prophets described in the Qur’an are also prophecies for the future therefore when acceptance of prayers and God’s mercy is cited it is applicable today as it was before, of course on the condition that man abides by God’s commandments. God’s mercy surpasses everything but man has been given responsibility to adopt taqwa (righteousness) to worship God, to love God more than anything else, to make every sacrifice needed to pay the dues of Allah and the dues of mankind, to believe in God’s Signs. Huzur said the advent of God’s eminent and holy people is also one of His Signs. In this age the true and ardent devotee of the Holy Prophet (peace and blessings of Allah be on him) was followed by many Signs; for instance the solar and lunar eclipses, earthquakes, the plague and many modern-day inventions. Huzur said when a claimant cites something and it comes to pass then it is a special Sign. God has made His mercy supersede everything else therefore man should be ever hopeful of forgiveness and should endeavour to follow God’s commandments. In particular believers should never be of the mind-set that they will be forgiven no matter what. The Promised Messiah (on whom be peace) said that God has put His laws in place and also punishes those who exceeds the limits. God has not stated that His mercy surpasses everything for the sinners, rather this has been stated with reference to those who abide by taqwa. It is the task of a believer to continue to seek this mercy and then be hopeful of God’s all-embracing mercy. May Allah enable us all to do so.